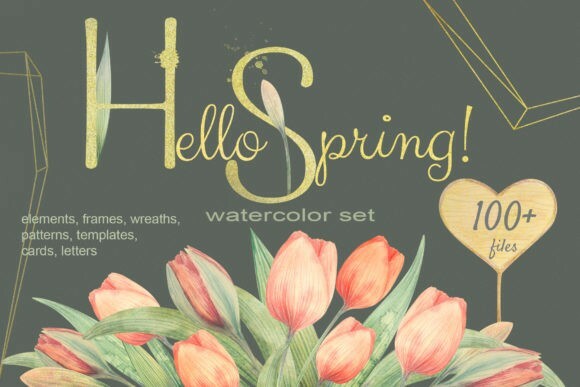 Hello Spring Watercolor Tulip Set Spring is a wonderful time, full of discoveries and new hopes. Young foliage, tender tulips and much more you will find in this set. I also added decorative elements in the style of the rustic garden: watering cans, flower pots and tags. All illustrations are drawn by hand with great love, they perfectly mix with each other. This will help you to create many unique compositions and to fill your holiday with a spring mood. Use the ready decor, find your new combinations. Create and let there always be spring in your heart! Perfect for DIY projects, T-shirts, bags, phone cases, fabric print, textile, holidays invitations, greeting cards, wedding design, quotes, blogs, posters and more. Click on the previews & scroll to see the full presentation of the product. This items is Free File of the week! And available free until April 5, 2019!